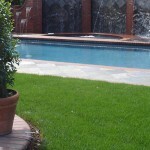 Artificial grass is a great alternative to natural grass and a great addition to any home or business. Artificial turf can be used in many different application. Here are a few more options to keep in mind when looking for a new surface or ground cover. We use cuts of turf in our company vehicles to protect our floor mats from dirt and stains. When working in the winter, our crew is known to get their boots muddy. Our vehicles stay cleaner and have less stains when we use turf as a floor mat. It is a cheap and good looking alternative. And is a great conversation starter! Don’t have a yard? Have a rooftop yard! Soft turf to play on, relax on, or just make your roof look better for parties. These types of installations can sometimes take extra materials to help with drainage and nailing of edges, but we sure love a challenge. We pride ourselves in doing all the work ourselves. Our crew has many talents and many years of experience with out of the norm installations. Do you get dirt in your pool? Artificial turf eliminates dirt in your yard. No more dirty feet in the pool and the sand infill doesn’t track. You could even swim in the winter with no worry about getting muddy. Artificial grass is also soft to walk on, therefore requiring no shoes! And it looks good! Cascade Greens has installed multiple indoor and outdoor sports fields of all types. Artificial grass is a great addition to your home or business, what better way than to make it playable? We install private residential and commercial sports fields of all types including, but not limited to, indoor/outdoor soccer fields and football fields. Cascade Greens is always open to new and different types of applications for our turf. We are happy to work with our customers to find just what they are looking for to complete their home or project. Call TODAY for a FREE consultation.